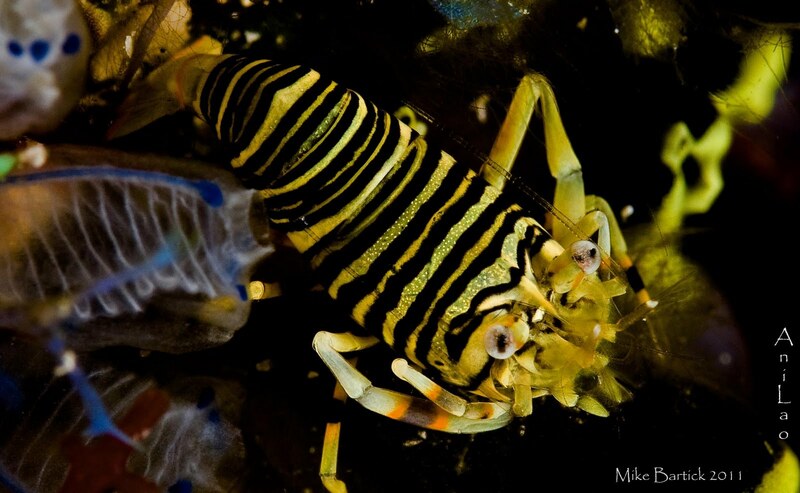 Striped Bumblebee shrimp can be found everywhere throughout the Indo-pacific. Found in broken rubble and on sea cucumbers and often in the shallows. The alternating Yellow and black bands are perhaps the most obvious reason their called Bumblebee. And if you have ever seen one of these guys ambulate through the water it resembles the way a terrestrial bumblebee actually flies. Difficult to shoot at best for several reasons, first is these guys are small, so even if you have a guide helping you it can easily get away. The second is their always moving. Trying to get a nice sharp eye shot has proven to be very difficult. I shot this photo very quickly as it jumped onto some tunicates, after just a couple of quick shots it leaped up and buzzed away, just like a real bumblebee.